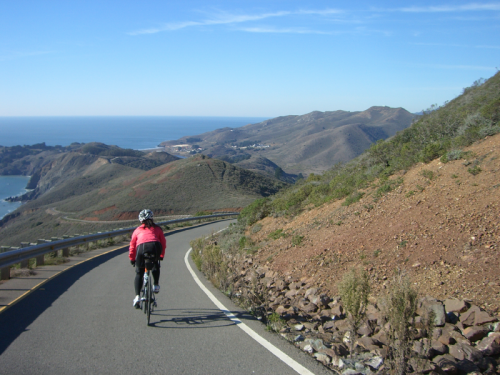 After receiving input from many San Francisco Randonneurs riders it was clear to me many felt intimidated by the amount of climbing and general difficulty of La Ruta Loca Randonnee and other Mixed Terrain Brevets in the SFR calendar. Most comments were along the lines "I would love to do it but i think it is too hard" or "I don't have a bike for that" my response has always been "you won't know until you try it, I bet you would have a great time and if you feel it is too much, there are plenty of places to bail out"
I threw the idea of a Mixed Terrain Populaire and got, as usual, mixed reactions. However Ms Populaire Tsarina herself Kimber G. was very interested on the idea. I decided I would first create a route and offer it as a Permanent and then if that worked submit it as a SFR 100k Populaire. I started working on a more mellow, less climbing, shorter Mixed Terrain route for the basis of the Permanent and after a couple of days I had a draft. El Paseito Mixto was born. 103km, about 5300ft of elevation and approximately 20% of the total distance are fire roads. I rode most of the route by myself on a Saturday and a few weeks later Invited some riders to come along, they liked it. Submitted my route to RUSA and it was approved right away. The ride starts at the Crissy Field Beach Hut Cafe in San Francisco. They open at 9:00 (close at 5:00pm) but when Jesse and I did the route, they open a few minutes late so for Permanent riders I recommend setting your start time at 9:15 just to make sure your start time is not affected by their opening time. Remember the clock starts ticking at the time you entered in the Permanent Registration Form not at the time you get the start receipt. Any bike you use on brevets can do this route. If you have not done many brevets and/or have just one bike, that bicycle is fine, believe me. Of course the wider the tires you use the more comfy the ride. I recomend at least 32mm tires. If you can fit wider tires go for it. However the route has about 13 miles of gravel so there is no need for super-duper knobbies. The ideal tires for this ride and most mixed terrain rides are the cheap ones sold for hybrid bikes. Choose something with a little bit of thread. Here is a how-to I wrote a while back about riding Mixed Terrain. Always ride within your means to stay in control of the bike. There is plenty of time to complete the ride. Early on it would look like you are behind schedule but with all the pavement between fire roads you will soon catch up and finish just fine. Relax, have fun and take photos so people believe you when you tell them of the great ride you did. From the Crissy Field Beach Hut Cafe the route goes up to the Golden Gate Bridge. Right after crossing the Bridge it climbs on Conzelman Rd to the top of Hawk Hill and then descends on a scenic steep winding one way road for 1.8 miles. 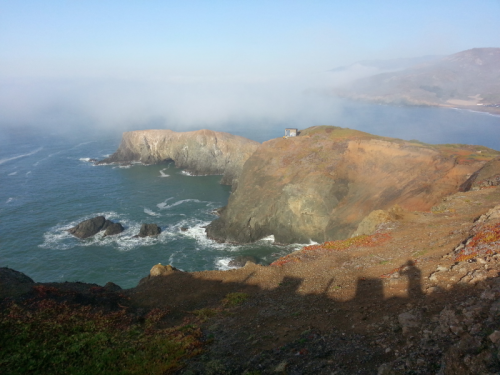 It goes towards Point Bonita Light House where the first Informational Control is at the end of a short gravel road. Answer the question on the card and take the lovely view. Once at the bottom, Rodeo Beach is on your right. The route continues on the main road and a little after the first stop sign you bear left abandoning the paved road to get into the Miwok fire road. This is a very well maintained gravel road. At Bobcat Trail make a right, the Gerbode Valley is on your left. After about a flattish mile, the fire road climbs for about another mile and then levels off. At the next intersection (mile 15) there is a new Informational Control, answer the question and stay on Bobcat which dips a little and then climbs again. A new intersection, Marincello Trail. Ride down towards the Tennessee Valley. At the bottom the Tennessee Valley Stables are on the left. Make a right towards the pavement (at least it used to be pavement there) and another right to ride towards Mill Valley on Tennessee Valley Rd. Now keep your eyes open for Marin Ave on your left, the entrance to the Tennessee Valley Pathway is on the sidewalk ramp at the intersection of Tennessee Valley Rd and Marin Ave (see the approach and the entrance to the path photo). DO NOT miss the entrance to the bike path here. Once you enter the bike path stay on it until getting to the Shoreline Hwy. The route continues on the other side of the Shoreline Hwy. You can use the pedestrian crossing or if more adventurous, ride (if you can clear the tall step) under the Hwy. Whatever you do make sure you continue straight on the bike path on the other side. You should be riding on a wooden deck path. I always feel the only missing thing here are some hungry crocodiles bellow waiting to be feed falling cyclist. A little after the end of the wooden deck path the route joins the Mill Valley-Sausalito bike path. This should be familiar territory to many SFR riders as most SFR Brevets use this bike path. Go North (left) on the bike path and short after the soccer fields on your right turn right on a new bike path. There is a water fountain at this intersection. Now the route follows bike lanes on regular roads to go to Strawberry where a new Informational Control waits. Continue towards Tiburon following mostly quiet streets and bike paths. There are restrooms/water on the left at mile 26.5. Once in Tiburon(mile 28.4) it is recommended to do a very short stop for food. Cafe Acri is right on the route and very popular with cyclist. They have not one but two restrooms and most weekends some good bread pudding (me likes.) Just keep in mind sometimes service can be slow as they are busy at the time most riders will be getting there. There are other places on Tiburon to get a snack, YMMV. 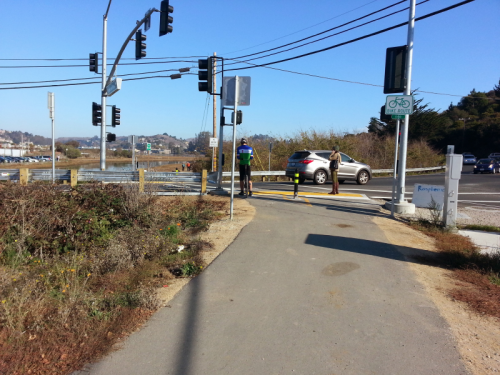 Continue on Paradise Drive till getting to the next Informational Control at the Romberg Tiburon Center (on the right.) This is near the bottom of a slight descend so make sure not to miss it. Continue on Paradise Dr. to Trestle Dr and make a left. At the bottom of Trestle Dr stay to the right of the road, on the glorified "sidewalk" and use the pedestrian light to cross Tiburon Blvd. This is a busy intersection, be careful. Follow the bike path and other streets as per the cue sheet. Be careful at mile 36 when the road goes over Hwy 101 and there is also a Hwy entrance. After going over Hwy 101 continue on Blithedale Ave, you are again in Mill Valley. Blithedale Ave leaves the commerce area and becomes a neighborhood street. The Railroad Grade Trail head gate is the start of the next gravel section. Railroad Grade is a little bumpier at parts than the fire roads used earlier on but it never climbs steeply. The gravel ends after a gate, Fern Canyon Rd is a paved neighborhood road that sees very little use. Gravel starts again and soon after there is a wooden shack on the left where there are two water spigots, you should use the one for humans unless you enjoy drinking from a bowl. If you are having mechanical issues there are tools/oil and a a first aid kit on a compartment on the side of the shack. Please only use what you need and if you can, consider leaving something there for others. Make sure you don't take a wrong turn on the next couple of intersections. The cuesheet should be very easy to follow. If in doubt you should always be going slightly up. Once at the West Point Inn answer the next Informational Control question. There are restrooms on the back of the porch and there is a lemonade and coffee table (small donation required) inside the building. There is also an emergency repair box between two of the picnic tables facing Mill Valley. Just like in the earlier one down bellow, only take what you need. The route now leaves Railroad Grade. The entrance to the Old Stage Road is between the picnic tables, it is well marked. This seems like a flat fire road but don't let your guard down. While the views are great, you are traveling down and there are a few turns where riders have been seen loosing control of their bicycles and kissing the gravel. Don't be one of them. A little after a new gate, the fire road ends and the route continues flat on the paved road until Panoramic Hwy. There are restrooms and water at the Pantoll Ranger Station across Panoramic Hwy. (Note: If you cross the hwy to visit the Pantoll Ranger Station restooms make sure you turn right when restarting. The cue sheet assumes you are NOT stopping at pantoll; whatever you do DO NOT go towards Stinson Beach!) The road stars a fast descend; it is recommended to turn on your tail light. At Sequoia Valley Rd make a left, this is an awkward intersection with trafic coming from diferent directions. There are a few stop signs on Sequoia Valley Rd and the rest of the way down that tend to pop out when you don't expect them. Once on Mill Valley and after riding on small streets you'll be back at the Mill Valley-Sausalito bike path at the same location visited earlier. Make a right on the bike path towards Sausalito. 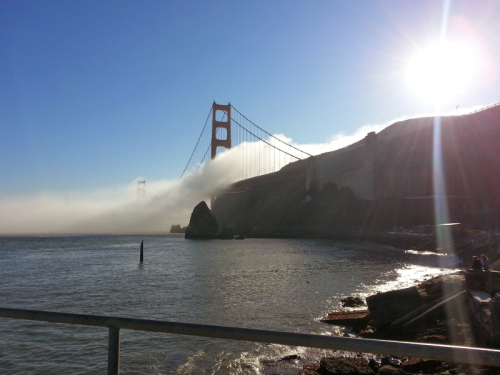 Ride trough Sausalito and climb towards the Golden Gate Bridge. However the route uses the more scenic way to The Bridge so look up for the connector road that goes UNDER Alexander Ave, you should BEAR RIGHT, right before the wooden Bus Stop. After a flat section East Road descends to the waters edge, The Discovery Museum is on your left and the Cavallo (something) fancy resort on your right. At the end of East Rd, make a left towards the water. The Pier is the location of the next Informational Control. Continue towards the Golden Gate Bridge, the road goes under The Bridge and eventually gets to the parking lot. Enter the West sidewalk ride across The Bridge and follow the bike path on the South end until Long Avenue. Down towards the beach and stay on the GRAVEL path along the beach. after a mile you should be at the same place where you started earlier. That's it. A good Mixed Terrain Permanent (or Populaire) accessible to most. Thanks for the great info. 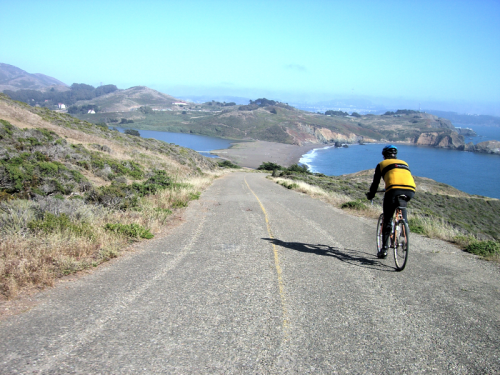 Going to try the first part of the route tomorrow, returning after Tennessee valley rd. I've been tempted to start getting back on some dirt and your site's been a good resource.